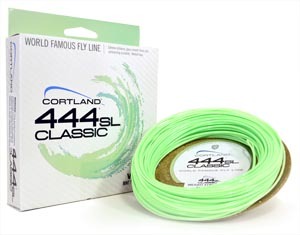 Developed specially for anglers concerned with distance casting and overcoming wind, the 444 SL is a Specialized Line produced from a unique formula that provides a greater degree of stiffness than other Cortland lines. This feature reduces friction caused by line sag between the guides, thus increasing the efficiency and distance of your cast. 444 SL Classic's special taper designs are customized to the line weight to give you tighter loops and better line control. An extended taper design and super smooth finish have been built around memory free core for longer hassle free casts. The 444 SL Classic is an extremely high floating, durable line that is designed to enhance and maximize your fishing experience. Colour: Mint Green Length: 105 ft. 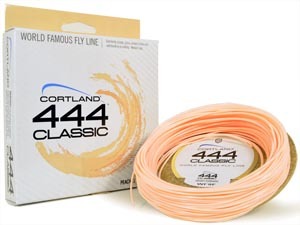 The suppleness of 444 Classic fly lines is desired by fly fishermen all over the world when delicate fly presentation is a critical factor. Special taper designs are used to assist in tight loop control and pinpoint casting accuracy. You maintain maximum control of every cast. 444 Classic's special formulation contains unique properties that make it float extremely high on water surfaces. Line pick up becomes effortless with less chance of spooking fish. The glass smooth finish allows the line to pass through rod guides with less friction and noise. Every cast is smooth. Colour: Peach Length: 90 ft.